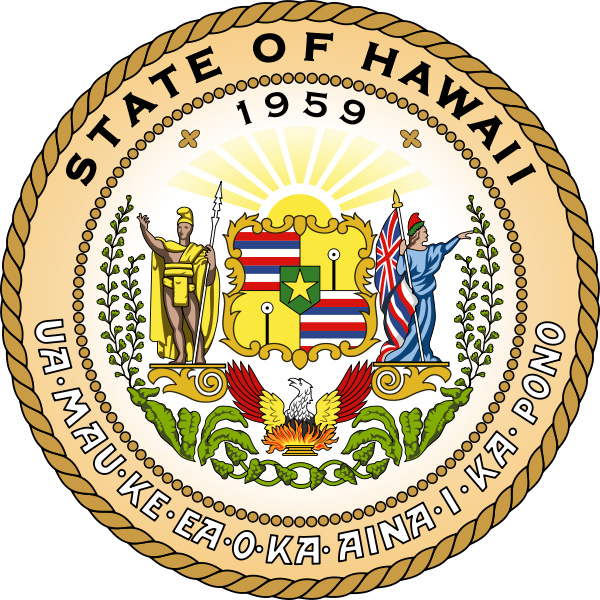 The Seal of the US state of Hawaii has been provided by the Republic of Hawaii in service. The Nene (pronounced "nay-nay") is a land bird and a variety of goose. It has adapted itself to life in the harsh lava country by transforming its webbed feet into a claw-like shape and modifying its wing structure for shorter flights. Hunting and wild animals all but destroyed the species until they were protected by law and a restoration project established in 1949. Sugarcane, pineapples, nursery stock, livestock, macadamia nuts. Industry: Tourism, food processing, apparel, fabricated metal products, stone, clay, and glass products. The State Flag has eight stripes (representing the eight major islands), of white, red and blue; the field closely resembles the Union Jack of Great Britain, from which the original flag apparently was designed. The state flower is the yellow Hibiscus Brackenridgei. 13796 feet Inland water: 46 sq.mi. The words Ua mau ke ea o ka aina i ka pono which mean "The life of the land is perpetuated in righteousness." The saying is attributed to King Kamehameha III on July 31, 1843, when the Hawaiian flag was once more raised after a brief period of unauthorized ursurpation of authority by a British admiral. Could be based on native Hawaiian word for homeland, "Owhyhee"
Hawaii's two official languages are Hawaiian and English. Ah, Hawaii... what a nice place. They grow nuts, fruit, and coffee. The coffee is expensive. It is mild, often too mild: It can be wonderful! It can be terrible and flat. The best coffees cost a lot ...the worst cost way too much. 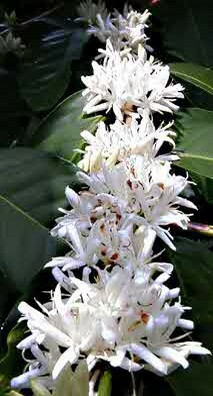 So the goal with Hawaiians is to quit thinking that all Hawaiian coffee is good, and to realize that only a handful of coffees deserve the high price in terms of cup quality (you can easily argue that all deserve a high price in terms of the care and labor expended in producing them). And frankly, you must pay quite a bit for the truly great small-farm Kona. In terms of the other islands, we like some coffees from Maui, a handful of Molokai can be okay, and we have not had an impressive coffee from Kauai.In a historical sense, coffees like Kona are the pinnacle of a particular definition of what "good coffee" is ... clean, pleasant, mild, good aftertaste. This is a notion of "good coffee" handed down from a time when low-grade coffee was called Brazil Rio and it had a seriously foul, dirty taste (so distinctly awful it is still called Rioy in defective coffee terminology). 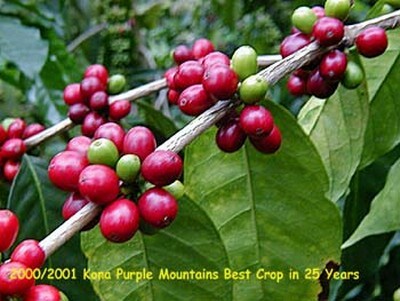 The best coffees were considered the polar opposite; island coffees -- mild, delicate and clean. Certain Specialty Coffees we now appreciate as intense and desireable cups, Yemeni coffees, Ethiopian Harar, Dry-processed Sumatras for example, would be considered terrible in this definition. If you love these intense coffees, Kona may seem too light, too simple, too mild. The even scores in the mid-80s indicate balance and solid quality. Consider this when you cup Kona coffees. Notes: I was very happy when the Greenwell sample arrived since we are out of the small farm Purple Mountain and Kowali Farm coffees. This is a beautiful opal-green new crop coffee with outstanding Kona cup qualities. Greenwell is a "model farm" and mill in terms of quality : they operate one of the finest coffee mills in the islands, milling coffee from not only their own lands but many top farms. Greenwell farm is a center of the Kona coffee culture. This is the type of Kona that deserves its price: perfectly prepped, nice aromatics, complexity, and that hint of spice that distinguishes Kona from other washed coffees. There is more acidity/brightness/livliness in this cup than any other Kona we have had, good indication that the coffee lands are at adequate altitude (something lacking in many Konas both in the cup and in the corresponding geography of the farms). It's a clean, lighter body cup with nice acidity (sometimes I think I get a piney flavor from this Kona), and hints of cinnamon. Rest it for at least 24 hours before enjoying to give the body time to develop.